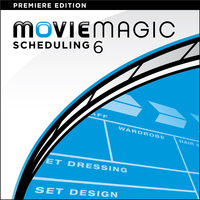 Movie Magic Scheduling 6 is a software solution that works the way schedulers think. Movie Magic Scheduling 6 software features powerful tools that enable you to create and view schedules with increased flexibility, accuracy, and efficiency. Your production schedule is the essential tool that takes your project from script to actionable plan. Movie Magic Scheduling 6 offers a range of tools you won't find in any other scheduling software. Workflows are designed to incorporate the time-tested concepts of the Stripboard while offering a variety of scenarios to consider: different shoot lengths, re-ordered scenes, comparisons in location, and more. Movie Magic Scheduling 6 helps you prepare schedules that allow your team to make the best production decisions possible. Create unlimited multiple schedules and shooting scenarios, then combine different boards with different calendars through drop down menus conveniently located on the stripboard. Easily add elements to your breakdown sheets through a quick and simple interface. Import Scripts Import elements from popular screenwriting software such as Final Draft and Movie Magic Screenwriter. Link items together so that when one element is inserted on a breakdown sheet, the linked elements will be inserted also. Set reminders that dynamically appear on the Stripboard when your Elements have conflicts to help avoid potential scheduling disasters. Attach images, such as storyboards, location photos, or actor headshots to your breakdown sheets. The zoom tool makes it easy to see what will fit onto the page before you print. As you can see, Movie Magic Scheduling 6 offers a range of scheduling tools and flexibility not found anywhere else. Use it today to produce an accurate and professional film schedule.